OK, these may predate the 1980s by a few years, but many people will probably have fond memories of a videogame system that was at least similar in some way to the Binatone TV Master. These games systems plugged into your TV and transformed it into your own personal video arcade! Â Well, that was the idea, but the games you got once you finally managed to get the TV tuned in to the correct frequency were generally all forms of that granddaddy of the videogame, Pong, and most likely were only black and white with the odd blip as a sound effect. Â The games may have been called things such as Squash, Tennis and Football, but at the end of the day all that changed was the size and number of bats on screen, and where they were positioned. The Binatone TV Master came with two controllers that consisted of little more than a twisty knob. Â Twisting the knob one way moved your bat up the screen, and twisting the other way moved it down. Â That was it. Â They were generally incredibly sensitive so you had to be very controlled in how you moved your bat so that you didn’t miss the ball. Â Two controllers were necessary since generally none of the games had a one player mode, so you always needed an opponent in order to play. 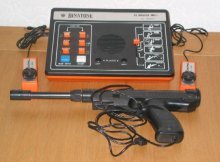 The pictured system is the Binatone TV Master Mk 6 which also came with a light gun. Â I remember we had this particular system in all its lurid orange plastic glory, and I used to enjoy playing the two light gun games the most. Â On these a big white dot bounced around the screen, and you had to aim the gun at the dot and press the trigger to shoot it. Â The only trouble was my accuracy. Â I couldn’t really play the game properly as my aim was so poor, so I usually resorted to holding the gun a few centimetres from the screen to shoot the bouncing dot. In later years Binatone released an upgraded version of the TV Master called the Colour TV Game. Â As you can probably guess it now had colour graphics (although a white ball on a green background isn’t much different to a white ball on a black background really) but this is really the only difference. Â The games themselves were identical to the monochrome system. Below you can see a sample of the videogaming goodness that you got with the Binatone TV Master, as you can see a pitched battle of Tennis playing out! This entry is filed under Toys - Videogames	and was posted on October 15th, 2008. You can follow any responses to this entry through the RSS 2.0 feed. You can leave a response, or trackback from your own site.